The Flagstaff Community Supported Agriculture (CSA) & Local Market became the first grocery store in Arizona to accept the Double Up program, managed by Pinnacle Prevention, in September. The Double Up Food Bucks program is now available at a Phoenix corner store for the first time. Double Up Food Bucks Arizona helps families who utilize SNAP benefits (formerly known as “food stamps”) take home twice as many fruits and vegetables. The program currently operates at 23 farmers markets, 3 farm stands, 4 CSAs, and 2 mobile farmers markets. When customers shop at any Arizona Whole Foods Market on Thursday, Jan. 10, five percent of sales will be donated to Chandler-based nonprofit Pinnacle Prevention for their Pots to Love program. 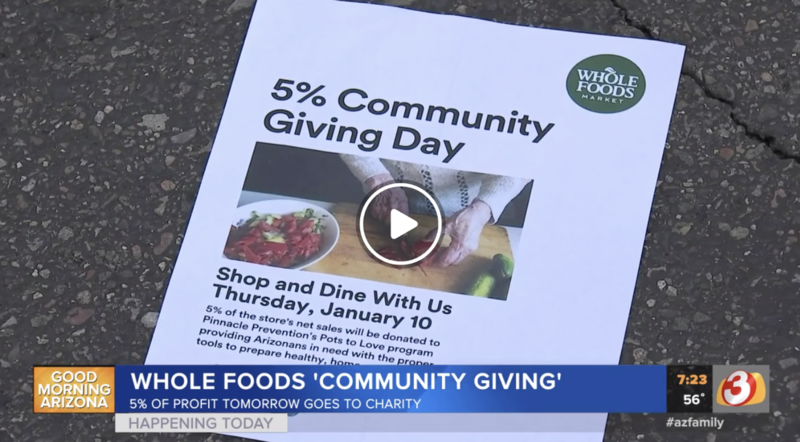 Whole Foods Market has selected Pinnacle Prevention as the Arizona recipient of their 5% Community Giving Day on Thursday, Jan. 10. 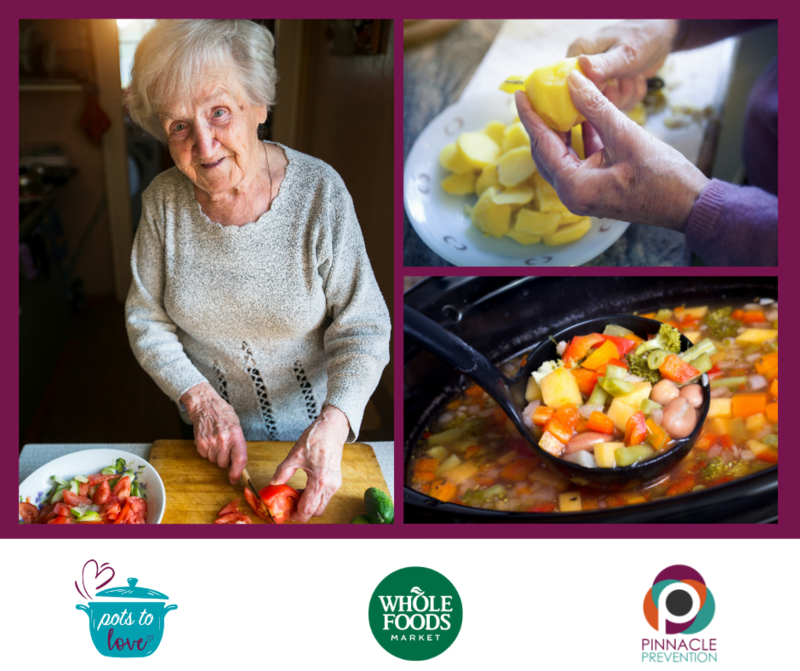 As part of the company’s commitment to its communities, Whole Foods Market will donate 5 percent of net sales from their 10 Arizona stores to support Pinnacle Prevention’s Pots to Love program. 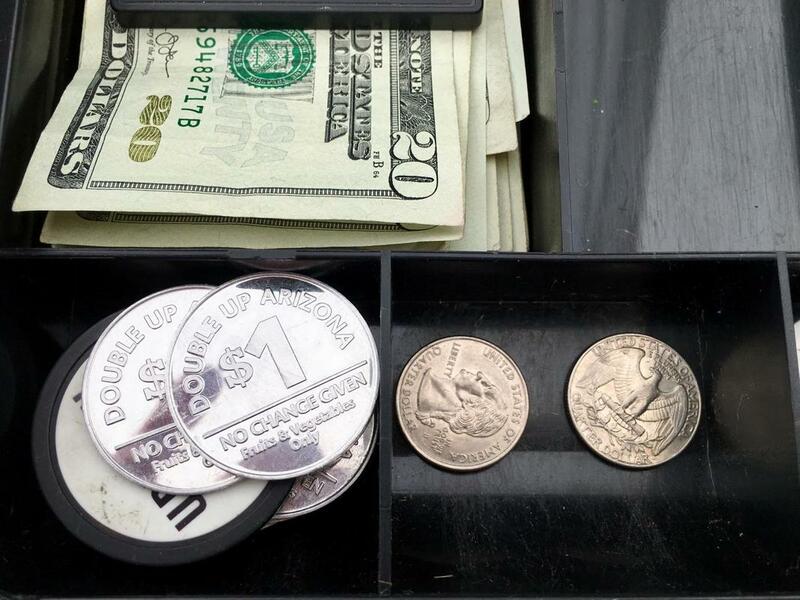 For the first time in Arizona, the Double Up Food Bucks program will be available at a Phoenix corner store. 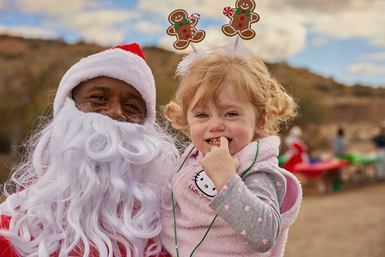 On Friday, Jan. 4, the program will launch at the Best Farmers Market corner store located at 4825 N. 27th Ave.
On Dec. 1, families can explore Globe’s Old Dominion Park on a Saturday after lunch walk with ‘Fit Santa'. Pinnacle Prevention is using it to boost its Double Up Food Bucks program. 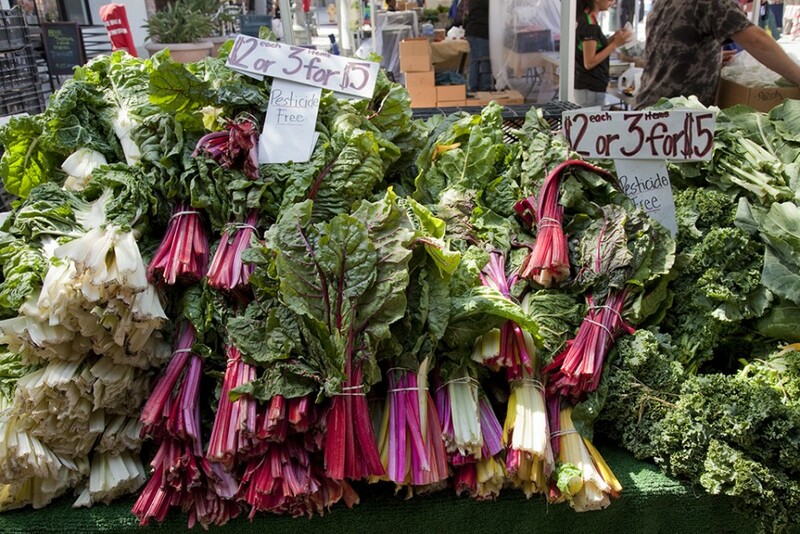 By July, farmers’ markets across the country are in full swing. But for many farmers’ market managers, the mid-season momentum turned to confusion and scramble. 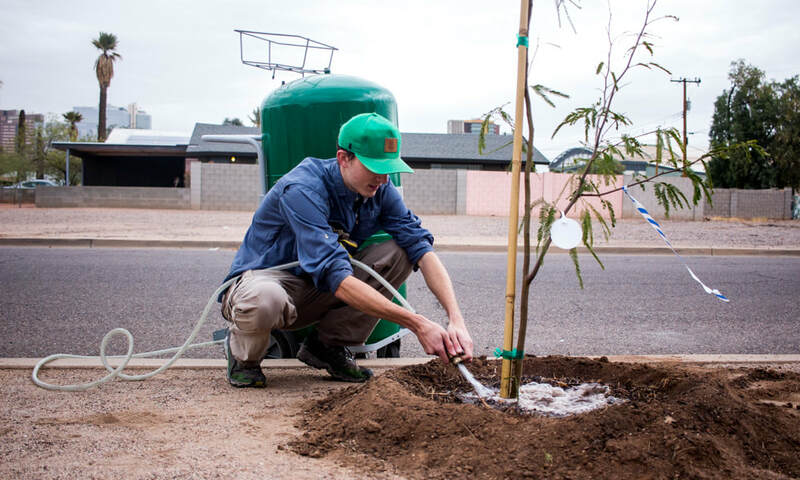 Killip Elementary School is the first school in Flagstaff to certify its school garden. 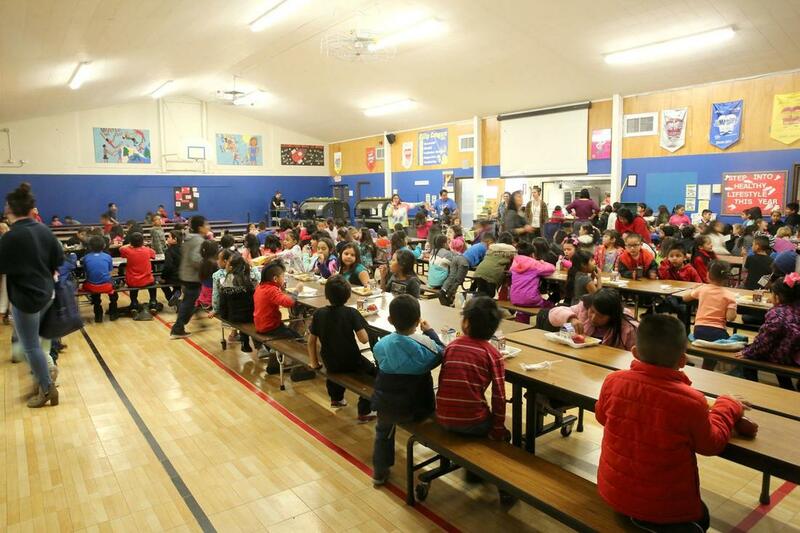 Using what is called a ‘best practices’ approach, produce grown in the garden can now safely be served in the lunch room and at after-school programs. Did you make goals for yourself in January? How are you doing so far? For many the beginning of a new year is for reflection, change, and setting goals. Oftentimes, these goals focus on maintaining healthier lifestyles, like changing what we eat or how our bodies look and feel. Sometimes, however, the expectations we set for ourselves and the ways we go about reaching them can be unrealistic and ultimately unhealthy. For many women, maintaining a positive body image is a constant challenge. ​Our Executive Director, Adrienne Udarbe, was featured on Chandler Magazine's "Real Women of Chandler" list. Click here to check out the May issue, and to read about the work Adrienne and others do to help make communities healthy and happy each and every day! It’s not often you hear bipartisan support at the state Capitol to increase spending on social welfare. But it’s happening. 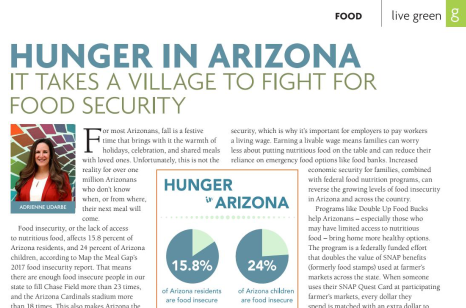 Supporters say the program will provide low-income Arizonans with more nutritional food and boost the bottom lines for local farmers. ​Complete Streets were nearing a dead end in Phoenix. But after 42 meetings and three years of inaction, members of the city’s Complete Streets Advisory Board started a citizens’ petition to finally spur city leaders to vote on new Complete Streets guidelines. 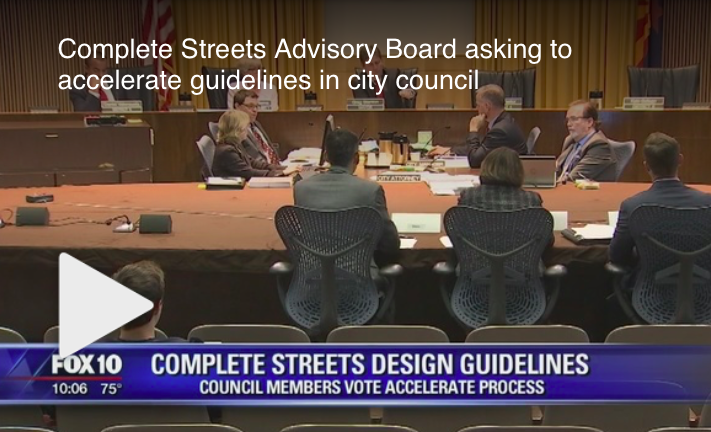 Petitions calling to improve streetscape, safety, and trees and shade guidelines were debated at a Phoenix City Council meeting Wednesday, leading to city actions related to both. 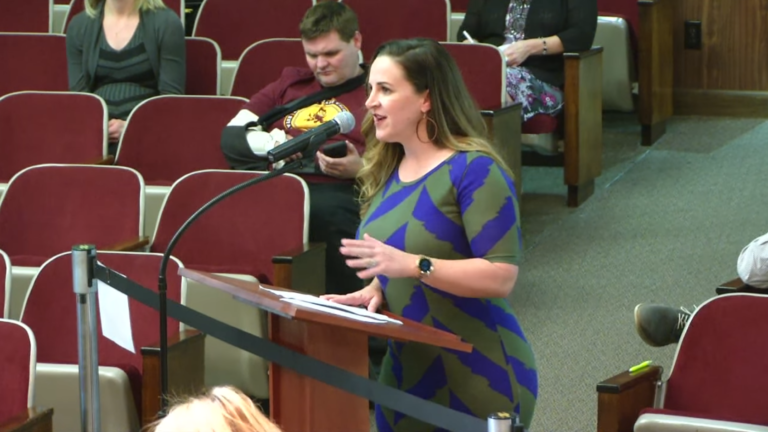 The petitions heard at the meeting were created following concerns with programs already in place and looked to improve overall livability and regulations. The Phoenix City Council tackled a dangerous problem on how to reduce the number of pedestrian accidents. "We want to make sure to prioritize our roadways, not just for cars, but for walks and bicyclists and all those different community groups," said Adrienne Udarbe, the Executive Director of Pinnacle Prevention. As the family of late GCU student Taylor White continues to mourn his death, after he was hit by an SUV, the incident is also casting a light on the dangers sometimes faced by pedestrians. White is one of at least 30 pedestrians hit and killed by cars in Arizona in 2018. A little-known program is trying to make a bigger name for itself at the State Capitol and in the communities that need it. Have you heard of Double Up Food Bucks Arizona? It has been around since 2015, but program organizers said not enough people are using it. The local food movement has been criticized for catering to middle- and upper-class Americans, and for leaving behind the low-income in all of the hype... But in the last decade, food justice activists have sought to correct this, connecting low-income consumers with cooking classes, gardening workshops, children’s programming, and locally grown and culturally appropriate foods. Big-Gulp drinkers can breathe a sigh of relief: Arizona lawmakers have succeeded in their push to ban special taxes on soda pop. On Friday, Gov. 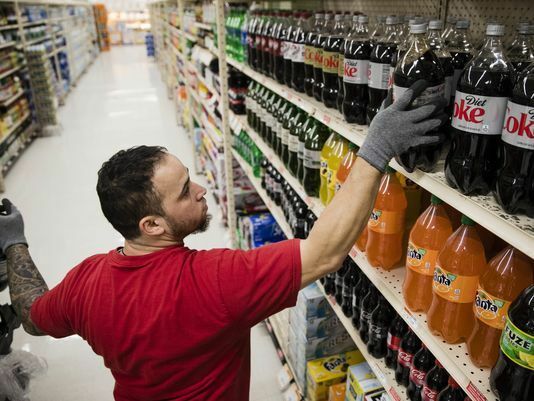 Doug Ducey signed House Bill 2484 to prohibit cities, towns and counties from imposing extra taxes on soda or sugary drinks, as some liberal-leaning cities in other states have done. It should come as no surprise that the February 23 guest commentary, “Taxpayers shouldn’t feel bubbly about taxing sugary beverages” by Thomas Aiello, was penned by a Washington D.C. lobbyist, not someone with expertise in public health who is watching the state Legislature preemptively push back on local control in a reactive versus proactive manner. ​For many of us, the beginning of the year means being healthier, whether it's eating well, working out more or just focusing on overall self-care. So it was only fitting for January's Who's Next recognition to include up-and-coming professionals in health and fitness. As the holiday cooking season continues, your children’s winter break is a great time to involve them in the kitchen, too. “Kids of all ages can start learning more about where their food comes from,” said Adrienne Udarbe. RDN and executive director of Pinnacle Prevention. For most Arizonans, fall is a festive time that brings with it the warmth of holidays, celebration, and shared meals with loved ones. Unfortunately, this is not the reality for over one million Arizonans who don’t know when, or from where, their next meal will come. Holiday parties are among the most challenging settings of the season for those trying to stay healthy and not gain weight between Thanksgiving and December celebrations. But there are a number of ways to mindfully enjoy delicious treats at parties and not feel guilty about what you’re eating. Community members are invited to explore the great outdoors and participate in free activities at the “Healthy Holidays on the Trail” event on Saturday, Dec. 2, 2017. 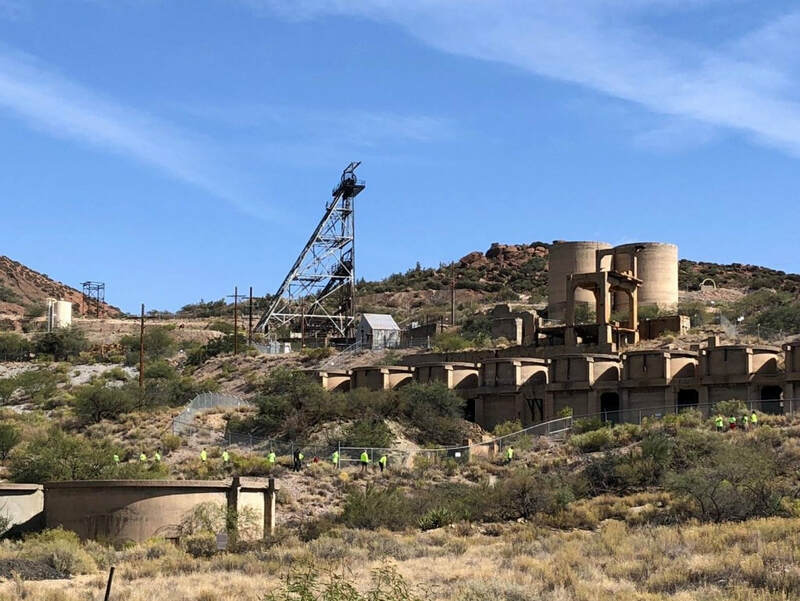 The event is hosted by the Pinal Creek Trail Committee; families and kids of all ages are encouraged to join in on various activities along the Globe Ledge Trail. 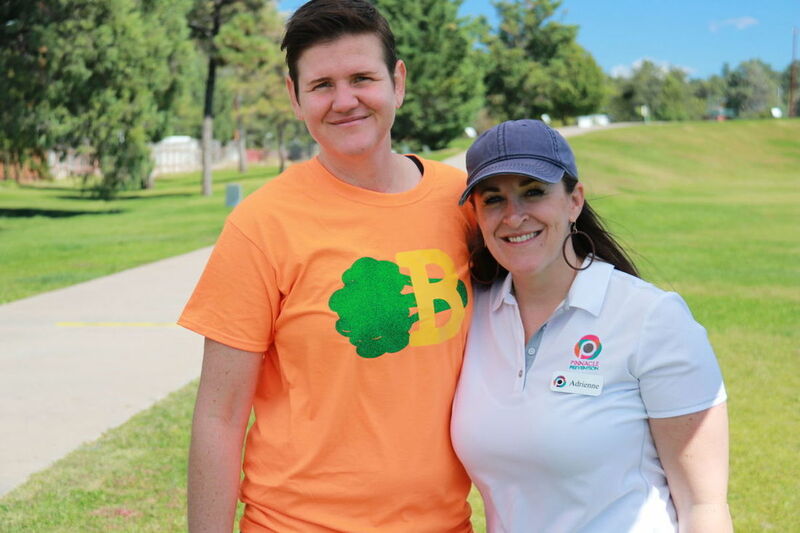 On the morning of the last day of September, families wandered around the grass bowl at Green Valley Park reading the story of Baxter, a kid who loves broccoli. Adrienne Udarbe, the executive director of Pinnacle Prevention and her fellow co-workers, including Bethany Cheney, handed out bright green backpacks, nutritional information and healthy snacks to the walkers - young and old - who participated in the program. Breakfast isn't necessarily the most important meal of the day, but it certainly ranks in the top three. A salad doesn't have to be limited to a supporting role at dinnertime. Limitless options can make it a delicious main attraction. "A salad can be a wonderful and nutritionally balanced meal," said Jaclyn Chamberlain, RDN, a registered dietitian nutritionist with Pinnacle Prevention, a Chandler-based nonprofit that works to improve access to healthy food and create opportunities for healthy living. More than 13 percent of young Arizona children are obese but that was below the national average, a nonprofit group said. The State of Obesity — a partnership between the Trust for America’s Health and the Robert Wood Johnson Foundation — ranked Arizona children 32nd in the nation for obesity. Metered parking spaces were transformed into temporary parks in Phoenix to provide different ways to use public spaces. Jessie Gruner, 28, and Adrienne Udarbe, 39, chose to transform a parking space into an informational area. Their park was 'Farm where you are,’ which was meant to show people that public parks should be used to grow or sell food. Parking spaces were swapped for green community areas for Phoenix's 9th Annual Park(ing) Day. Park(ing) Day is a nationwide event that occurs on the third Friday in September. 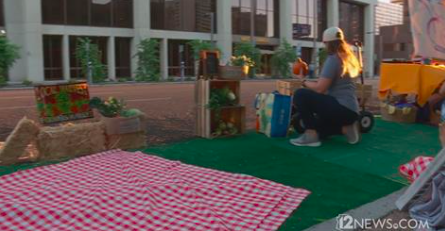 This year, groups decorate their parking spots at 1st Avenue and Washington Street in Downtown Phoenix from 7 to 10 a.m.
From 6 a.m. to 10 a.m. on Friday, metered parking spots in downtown Phoenix transformed into public parks. The event is called PARK(ing) Day and is a global event. Major cities participate in the day which challenges people to rethink the way streets are used and reinforces the need for broad-based changes to urban infrastructure. Lunches for school prepared at home don’t have to be time-intensive to put together. A bit of pre-planning, letting your creativity loose and getting your kids involved can help you build a box lunch in less than 10 minutes. “Prepping food ahead of time can make packing lunches a breeze,” said Jessie Gruner, R.D.N., a registered dietitian and nutritionist with Pinnacle Prevention. A nutrition-based program, spearheaded by Arizona nonprofit Pinnacle Prevention, is helping people bring home more healthy fruits and vegetables while also supporting local farmers. 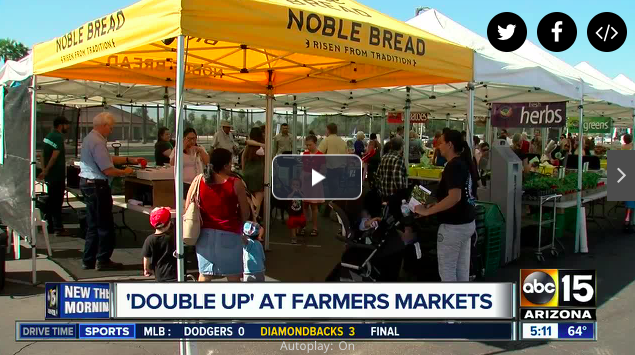 Double Up Food Bucks Arizona is a federally funded effort that doubles the value of SNAP benefits used at farmers markets across the state. With the new “Double Up” program at the Sierra Vista Farmers Market, SNAP customers will have extra buying power to purchase fresh fruits, vegetables, and dried beans from growers like Edith Beatty, pictured, from Beatty’s Guest Ranch in Miller Canyon. It can get expensive to buy fresh fruits and vegetables. 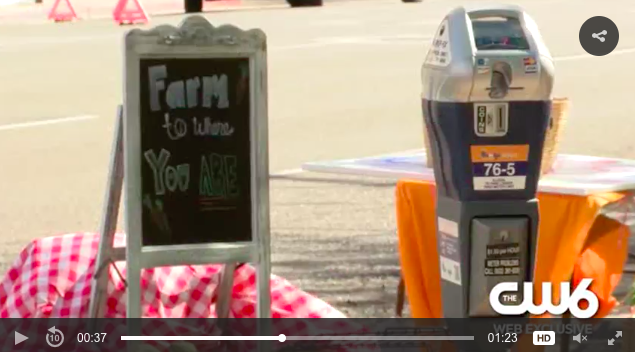 And it’s not uncommon for people who use the Electronic Benefit Transfer system, formally known as food stamps, to live in food deserts, said Kelly Rivas, the manager of the Prescott Farmers Market. The lack of available grocers often leads people to rely on drug or convenience stores for food. But local farmers markets can provide a healthy alternative. 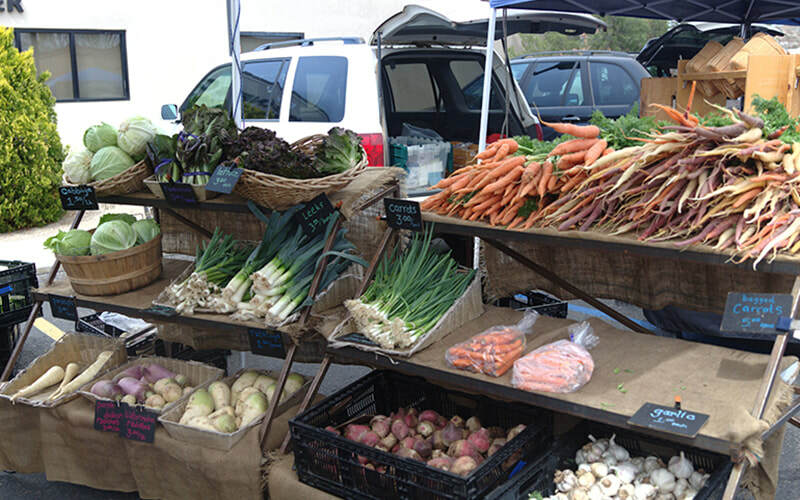 ​The Payson Farmers Market opens Saturday, May 27. 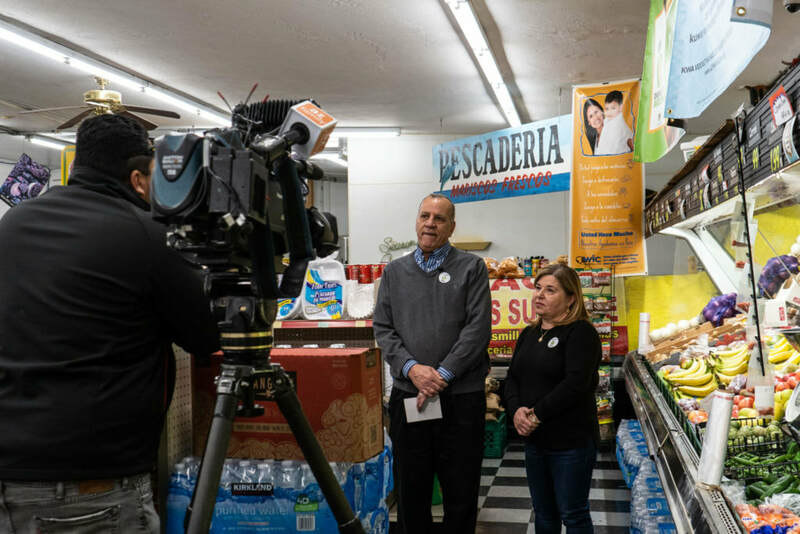 Organizers have partnered with the Arizona Department of Health, Pinnacle Prevention and the USDA to offer four federally funded programs to help low-income shoppers. ​It might be easy for an average Arizona family to regularly purchase fresh fruits and vegetables in the neighborhood grocery store or their local farmers market. But what about disadvantaged Arizonans financially strapped and living in what’s known as a food desert? One organization is trying to change that. 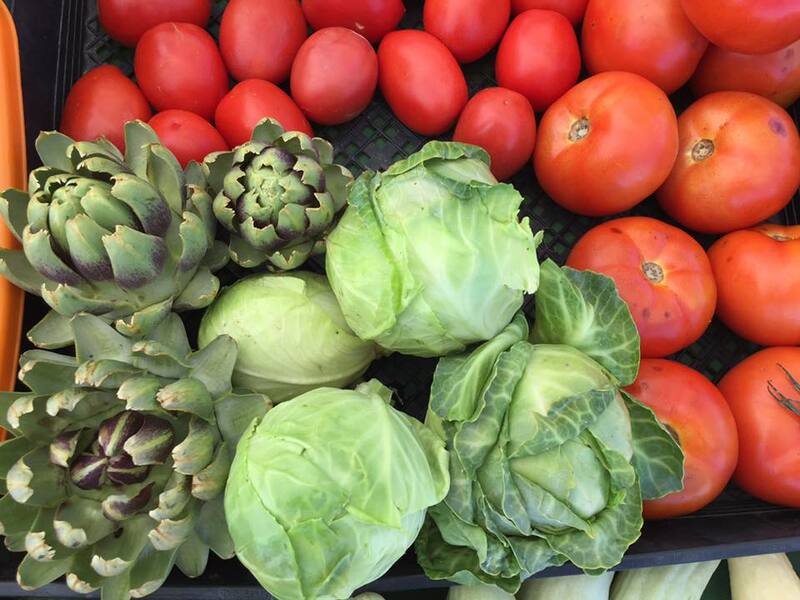 ​For two weeks, Maryvale has held a farmers market in El Oso Park. It's all a part of making the community more sustainable and healthy. For many folks, strolling around the local farmer's market is a Saturday ritual, but Congressman Tom O'Halleran says it's so much more. It’s just not the summer season without the Payson Farmers Market — and now no one needs to be afraid it’s too expensive to go. ​The new Double UP food Bucks Arizona (Double Up AZ) program is helping to ensure more people have fresh healthy fruits and vegetables in their diet. Having better access to locally grown organic foods is also helping to support local economic growth and health. 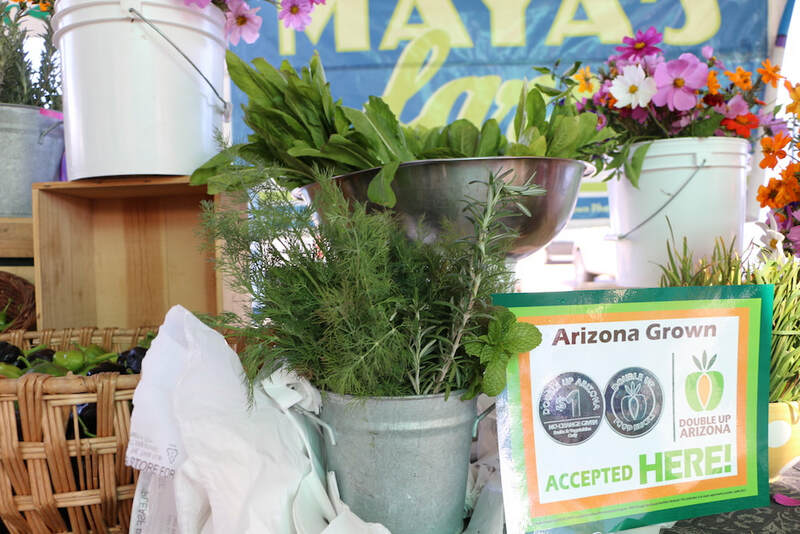 The farm fresh food movement is making its way to more tables right here in Arizona. Now, it is giving families who may not otherwise be able to afford the fresh diet, better access to organic goods. 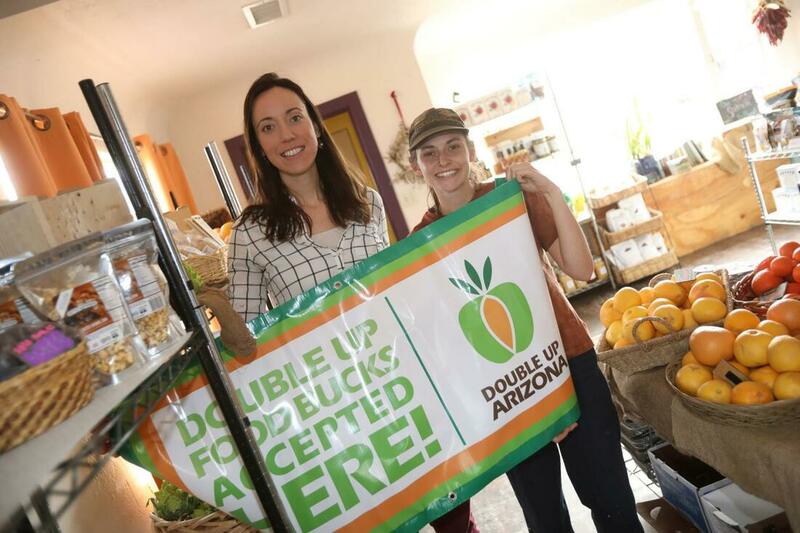 This new Double Up Food Bucks Arizona program helps send more healthy fruits and vegetables home with people across the state and supports local farmers. Does your neighborhood need more room to run, bike and play? Do you have enough access to healthy food? Yavapai County Community Health Services (YCCHS) wants to know what you need in your community to make it a healthier, happier place to live. YCCHS is partnering with Pinnacle Prevention, a public health services nonprofit, to conduct the 2017 Community Health Assessment. 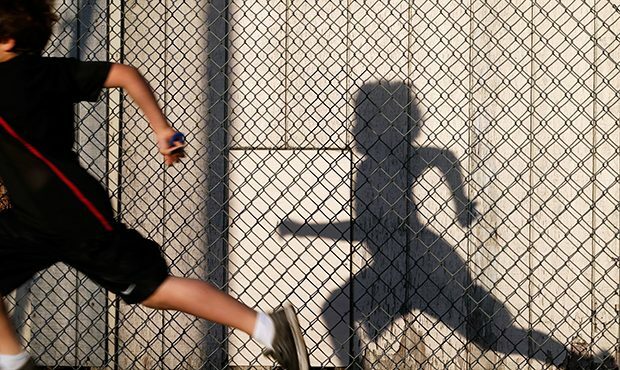 Opposition from school districts concerned about added costs led an Arizona Senate Committee to gut a bill Thursday that would have required schools to offer at least 50 minutes of recess for students in kindergarten through fifth grade. We were honored to be a part of Arizona State University’s Dinner 4020, where we got to collaborate with community members and experts discuss the future of food systems in Arizona. The eighth annual Park(ing) Day brought together local bands, organizations and community members in front of the Phoenix courthouse on Washington Street between First and Second avenues on Friday. 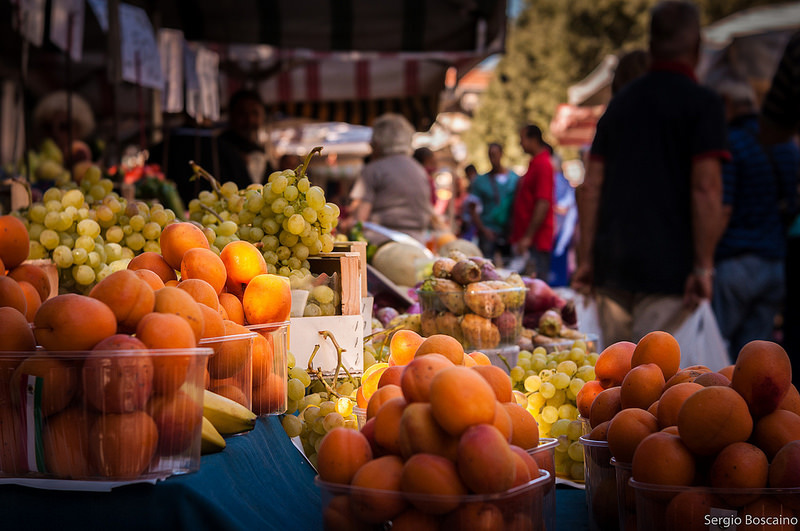 ​The Prescott Farmers Market is partnering with Pinnacle Prevention to launch the Double Up Food Bucks AZ (Double Up AZ) program at both the Prescott and Chino Valley Farmers Markets next month. Double Up AZ is a program that provides SNAP (formerly known as “food stamps”) recipients with additional money to spend on Arizona-grown fruits and vegetables when they use their EBT cards at participating farmers markets. 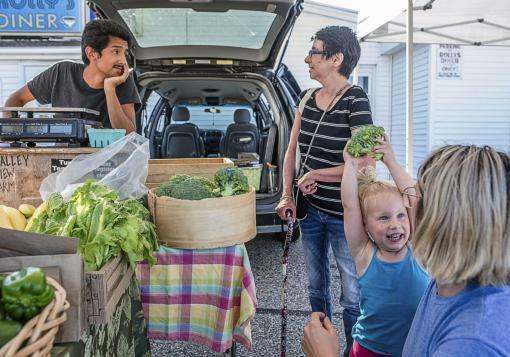 Low-income families’ food dollars will stretch farther when they start shopping at the Prescott and Chino Valley farmers markets. Beginning this Saturday, July 23, the markets will launch the Double Up AZ program. Double Up AZ provides SNAP (formerly known as “food stamps”) recipients with additional money to spend on Arizona-grown fruits and vegetables when they use their EBT cards at participating farmers markets. The U.S. Department of Agriculture (USDA) today awarded $16.8 million in competitive grants to help Supplemental Nutrition Assistance Program (SNAP) participants increase their purchases of fruits and vegetables. 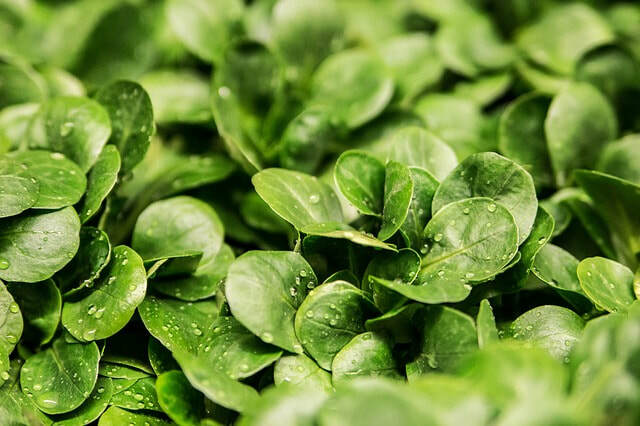 The funding comes from the Food Insecurity Nutrition Incentive (FINI) program, authorized by the 2014 Farm Bill and administered by USDA's National Institute of Food and Agriculture (NIFA). 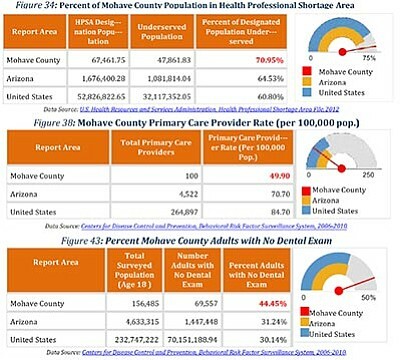 When Mohave County and Kingman Regional Medical Center teamed up in 2011 to develop a community health assessment, the idea was to put in the minimum effort needed to meet a requirement of the federal Affordable Care Act. 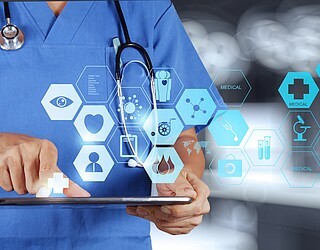 But then they realized how badly the county needed the assessment and "decided to take it a little further than we were required to do," said Teri Williams, the director of communications and marketing at the hospital.